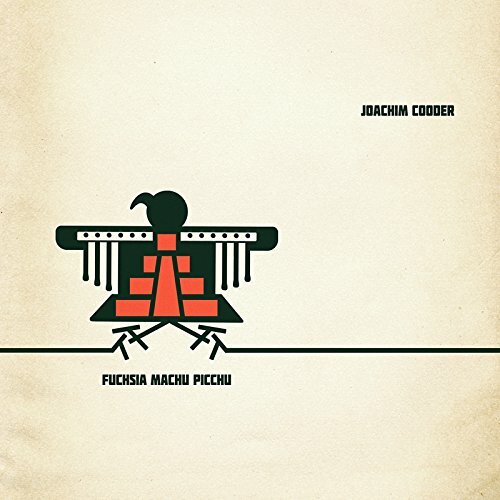 Listening to Joachim Cooder’s EP Fuchsia Machu Picchu, it’s easy to see how his famous father Ry Cooder got the atmospheric feel that dominates many of the tracks on The Prodigal Son, released last month. Cooder the Younger, who turns 40 later this summer, has been a drummer, percussionist and keyboardist on his father’s team for many years and accompanied his father on collaborations in India with V.M. Bhatt, for the Grammy-award winning A Meeting By the River in 1993, and with the Cuban consortium Buena Vista Social Club for their Grammy-award winning effort in 1997. He has also played on most of his father’s solo projects since the 1990s. But Joachim Cooder is no copycat of his father. His own music – including his debut album in 2012, Love on a Real Train – tends toward a dreamier, more ethereal realm than his father’s traditional roots music. It is difficult to readily classify. Fuchsia Machu Picchu continues those ethereal explorations. The title song, as Joachim explained while opening for his dad in concert recently, began as a simple serenade to a plant he was urging to grow in his Los Angeles garden. Among the best of the seven tunes are “Everyone Sleeps in the Light,” a performance of which you can view below (Hey, who’s that old guy on bass? ), and “Because the Moonlight,” which has a little Talking Timbuktu-style guitar sprinkled into the music courtesy of Dad. The album is a definite departure from the conventional roots music often featured on this blog. It’s not for everyone, but if you’re in the mood for some flowing, atmospheric melodies but aren’t looking to go full Eno, Joachim’s music might hit the spot. The EP is available for download at various places around the internet.